The nail polish was inspired by a custom-made table that Jacobs has in his house--it&apos;s covered with 30 coats of lacquer. So yes--the polish is shiny. Speaking of shiny, supposedly when you ask MJ what his favorite color is, he&apos;ll answer, "Shiny!" Which is why the clear polish is called... wait for it... "Shiny." There was also a red on display (though not on the models&apos; fingers, sadly) called "Jezebel." I think MJ is going to give Tom Ford a run for his money with this lacquer line. The packaging is totally original and looks like nothing that&apos;s on the market right now--a neat trick, because there are an awful lot of copy cat bottles out there (well, except for these). It just looks rich. The reps had no further information about other colors or how many would ultimately be in the range, but we&apos;ll find out this fall when it launches. 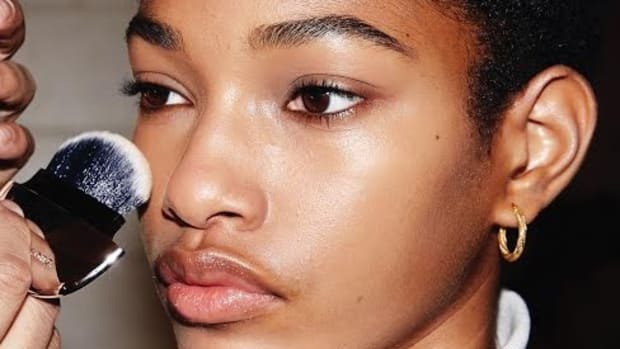 No other makeup from Jacobs&apos;s upcoming collection was available for analysis backstage. Francois Nars, as is tradition at the Marc Jacobs show, did the makeup look, which was inspired by rocker chicks like Joan Jett and Marianne Faithfull. Think a whole lotta black and grey eye shadow and liner. Guido Palau pre-cut 55 wigs for the show, razor trimming them on each model, then spritzing them with some water and Redken Shine Flash to make it look almost sweaty. Not "no-makeup makeup." ZERO MAKEUP.